Oakley announced a breakthrough that will allow many people with higher prescriptions to wear high-wrap sunglasses. Called Oakley True Digital Edge, the proprietary innovation will be available only with Oakley Authentic Prescription Lenses. 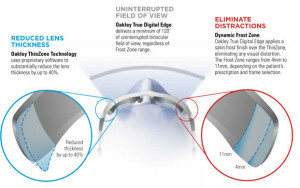 “Now patients who want the unrivalled style and improved side protection of high-wrap lenses won’t be impeded by prescriptions that would normally require them to settle for flatter sunglasses, or choose high wrap lenses with poor optics and inferior cosmetics,” said Oakley CEO Colin Baden. Using standard processes currently utilized in the industry, the manufacture of high-wrap lenses for out-of-range prescriptions results in excessive lens thickness and weight. The problems are not limited to cosmetics and comfort. Optical distortion reduces the practical field of view and the thickened lens edge can cause distracting distortion. Oakley True Digital Edge increases the prescription range up to +4.00 and up to -6.00, giving patients the clarity they need and the style they want with a minimum 120-degree binocular field of view. Oakley technologies eliminate the peripheral distortion that can result when prescriptions are applied to high-wrap lenses, a common aspect of optical physics. Oakley’s proprietary process begins by reformulating the prescription using Oakley True Digital (OTD) technology. This optimizes clarity and accuracy of vision from the centre of the lens to the edge, even for the company’s most extreme wrap sunglasses. Thanks to Oakley Thin-Zone the company is able to thin the lens edge by as much as 40 per cent to enhance aesthetics, safety and comfort of vision. The finishing stage entails a frost treatment to block any visual noise and/or distortion. “Visionary technology is a foundation of Oakley, and Oakley True Digital Edge further underscores our global leadership position in optics,” Baden concluded. This entry was posted in montures, verres ophtalmique by Envision Magazine. Bookmark the permalink.